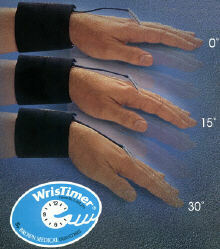 Wristimer® allows full productivity and helps restore healthy finger sensation and hand strength. Repetitive wrist motions irritate the median nerve, causing inflammation and carpal tunnel symptoms. By limiting the flexed wrist motion during work, Wristimer® allows full productivity and helps restore healthy finger sensation and hand strength. When used at night, WrisTimer PM® further reduces pressure on the median nerve, resulting in restful sleep. WrisTimer® is used by leading companies for prevention and rehabilitation of repetitive stress injuries. Designed by an orthopaedic hand surgeon. 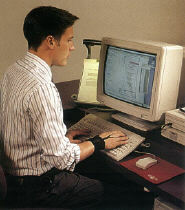 WrisTimer® is the ideal dynamic support for occupational use. Prevents damaging wrist flexion, while allowing healthy range of motion. Allows finger and hand grasping capability that enables full productivity at work. Allows desired range of motion. Permits easy adjustment for different size hands. Provides stable and comfortable wrist compression. Permits easy adjustment for different size wrists.